Shops and businesses in Rayleigh, Hockley, Rochford and Great Wakering will let you use a telephone or will make a call on your behalf if you get into distress. This might be if you may lose your phone, wallet, feel unwell or unsafe. You have your own card and key ring. On the card and key ring you can put the name/number of someone who can be contacted should you need them. You should carry your card and key ring with you at all times. Once signed up to the scheme, we will tell you where the Keep Safe venues are in your town. 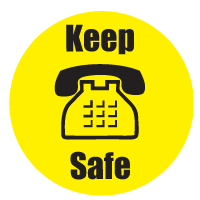 Keep Safe venues are also all over Essex – you can use any venue that displays the Keep Safe sticker in their window to identify that they are part of the scheme. The scheme is for anyone who may feel vulnerable whilst out and about. The scheme is free to join.